Chakras are energy centers within the body. When a chakra becomes blocked, it can create illness and/or psychological problems. Difficulties can manifest in your mundane life as well. Each chakra has a particular vibration which can be translated into color. They correlate to particular organs and emotions. It's not difficult to know whether or not your have a chakra imbalance once you learn to recognize their properties. If you have done any research on chakras, you will be familiar with the term " energy healing ". There are many types of chakra energy healing. Reiki is probably the most common. Most forms of energy healing will deal with balancing the chakras as an important part of the healing process. For healing to occur, the energy flow must be restored. I now offer chakra healing books to help you learn energy healing in it's various forms and disciplines. 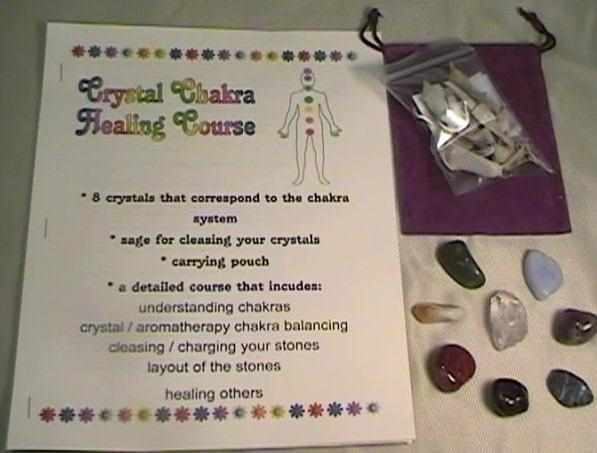 My chakra crystal healing kit is a complete kit and study course to learn how to do chakra energy healing with crystals and gemstones. Dr Doreen Virtue has created a CD and book set on chakra clearing via meditation. I also carry a variety of other energy healing books that include: reiki, shamanic healing and natural herbal remedies. I offer a free chakra balancing meditation in my blog. Note: Though it is not required, a pendulum is a very useful tool in chakra energy healing as it can pick up inconsistencies that may have gone undetected.